Swarovski Crystal Beads &Elements; Natural beads - Carved wood, bone, horn, shell, paper & fiber; Charms - vast assortment of charms in various finishes/metals; Pewter - plated with silver, gold, copper, and imm. rhodium; Plated metal beads: Silver, gold, vermeil, and copper; Sterling silver, Silver filled, & 14kt Gold-filled; Cubic Zirconia; Large Hole Beads (fit all the popular add-a-bead bracelets); Dichroic Glass; Swarovski Rondelle & Squaredelle Spacers; Resin Beads; Vintage German Glass; Mirage Mood Beads; Clay, Porcelain, Ceramic, & Raku; and many, many more!! Turquoise, Black Onyx, Coral, Ocean Jasper, Amethyst, Mother of Pearl, Blue Larimar Crazy Lace, Rhodocrosite, Rock Quartz, Amazonite, Garney, Jasper, Bloodstone, Rutilated Quartz, Peridot, Jet, Iolite, Carnelian, Citrine, Picture Jasper, Abalone, Rose Quartz, Fluorite, Chrysoprase, Striped Agate, Labradorite, Azurite, Silver Leaf, Tourmaline, Goldstone, Aventurine, Impression Jasper, Kyanite, Blue Lace Agate, Magnesite, Lapis, White Turquoise, Pyrite, Fire Opal Agate, Sodalite, Canadian Jade, Apatite, Chrysocola, Lava, Druzy Agate, Malachite, Fancy Jasper, African Sunstone, Moonstone, Hematite, Tiger Eye (gold, red, blue, honey), Howlite, Moukite, Hypersthene, Muscovite, Picasso Jasper, Rhodonite, Tiger Iron, Bronzite, Smoky Quartz, Obsidian, Unakite, and many, many more!! 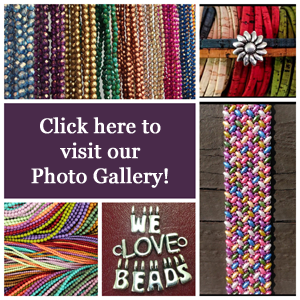 We are proud to offer the most unique selection of beautiful, high quality beads and supplies in Upstate NY! We personally hand select and carefully inspect every item we bring into our shop. - Czech & Japanese, Petite to Pebble sizes! 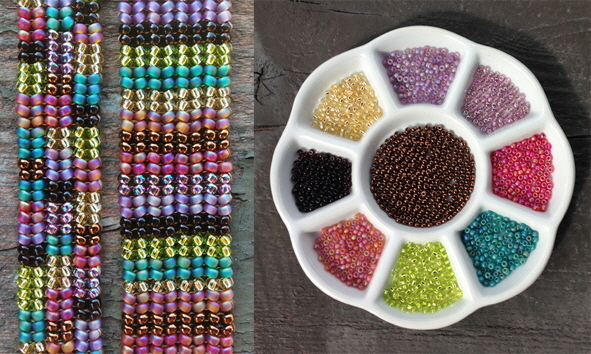 The following is a sample list of products we carry in our bead shop. Our inventory changes frequently and this list may not be up to date at all times.